Thank you Able, where do you pick all these infos from? I google the net and dont find much usefull stuff. Thomas, I normally obtain my reading and research from research journals and published grant studies from various universities. How can it then be ok to have Molybdenum? If I remember was it not so that this too is a acid? 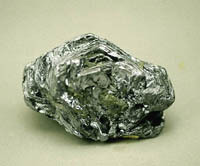 Molybdenum is an essential element or mineral, and not an acid. I posted a photo of it below. A nice looking ‘rock’ – yes? I was reading on the bottle SF 722 that it is a undecenoic acid. Is acid = acid? Not in the sense you’re thinking, Thomas. What we have to understand is that there are good acids, and there are ‘bad’ acids. For example, you can’t digest your food at all without acid being present in the stomach, but that’s not the only benefit that acids play in the health of a human being. Acids protect the body from pathogens that may otherwise enter the bloodstream through the digestive system. Also, the nutrients (from our food) that we need to make that stomach acid depend on acids in order to absorb the nutrients. If sounds like a cycle, it is, which means that we need acids available basically around the clock. Chronic acid reflux results only when there’s a lack of stomach acid. It’s a scientifically known fact that stomach acid declines as we age which leads to the loss of collagen, elastin, and chondroitin which occurs naturally in the body to cushion our joints and protect us from such illnesses as arthritis. If this list sounds like maybe they’re the same symptoms of aging, they are. That’s because, without acids, we would probably age ten times faster than we do, that is if we can remain alive without the acids. We were talking about B vitamins earlier; did you know that vitamin B6, B12 and folate depend on a sufficient amount of stomach acid for their absorption into the body and bloodstream? And then there’s the stomach acid called hydrochloric acid. We would all be suffering from, and I’m not exaggerating, life-threatening allergic reactions if not for hydrochloric acid. That’s because proteins are not broken down properly without this acid being present; proteins that are not broken down enter the bloodstream as they are and form antigens. These would lead to the life threatening allergies in the body. I also mentioned that there are ‘bad acids’ … these are the organic acids of bad fermentation of foods in the stomach and intestines, and they’re the ones that cause all the trouble. But the bad acids will only appear if there is an insufficient amount of hydrochloric acid available. What surprised me was the fact that adrenalin is used to break down if DAO cant manage the job. Do you remember that dreadful night I experienced with all the tremors and stuff and you told me that it probably was adrenalin Able?
. I also had bad spell when I took a B12 high in Folic Acid. I learned high folic acid is part of histadelia. What is folic acid, is that a bad one. As most of the fruits and veggies have it if I am not wrong in this?? Then I have a question about vitamin C. Vitamin C helps a lot to clean out histamin but the usual vitamin c in acid form is not good for me. What is vitamin C in ascorbate form? And what is the difference to ascorbic acid which I should not take.